Here is the finished product. 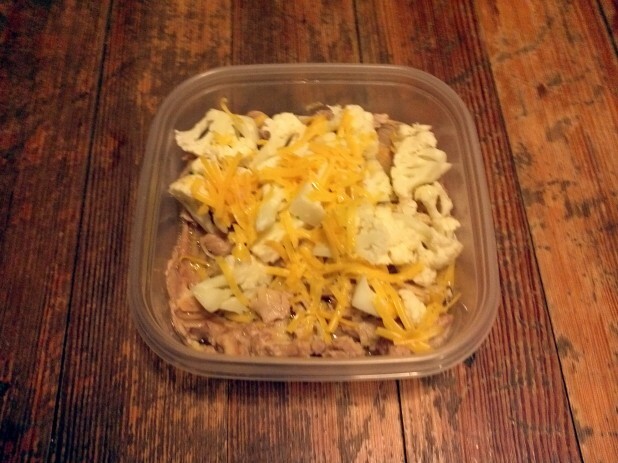 It is dead simple to make and is really easy to take to work. You just pop this in the microwave, it steams the frozen vegetables and heats up the meat. 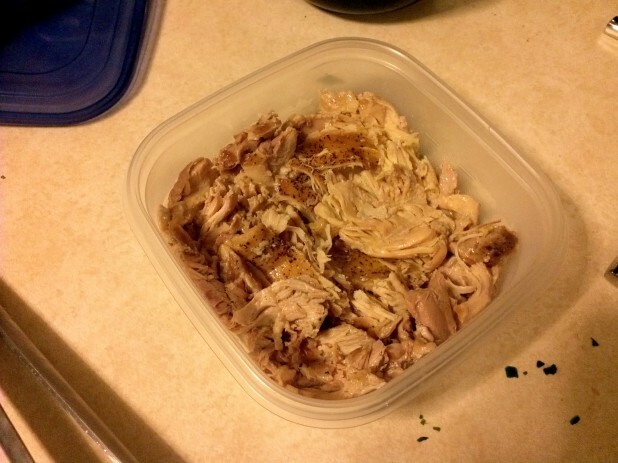 One thing to note, MAKE SURE TO GET GOOD CONTAINERS! Here is a link to something similar to my current containers. I bought them because they were cheap but now that I’m into the fifth week, the lids have already started to go. The only ones I can truly recommend are the Ikea 365+ Food Storage Containers. Unfortunately they don’t sell them online but if you find another brand that has a really solid seal and a vent, I would get those instead. While it might seem like a lot of money upfront, its better than having spilled food. Here are the thighs. 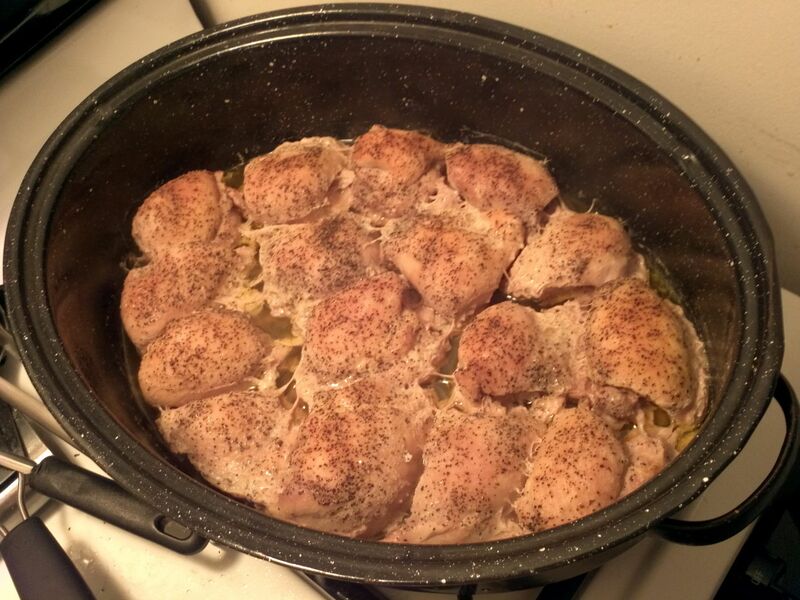 BJ’s sells a 6 pack, where each one has 4 boneless, skinless chicken thighs. So each pack is 24 thighs. You can also get bone in with the skin thighs for half the cost. At my store its $10 for 24 bone in with skin and $20 for the above. The bones pretty much fall off after the cooking process so this might be worth it if you want to save some money. 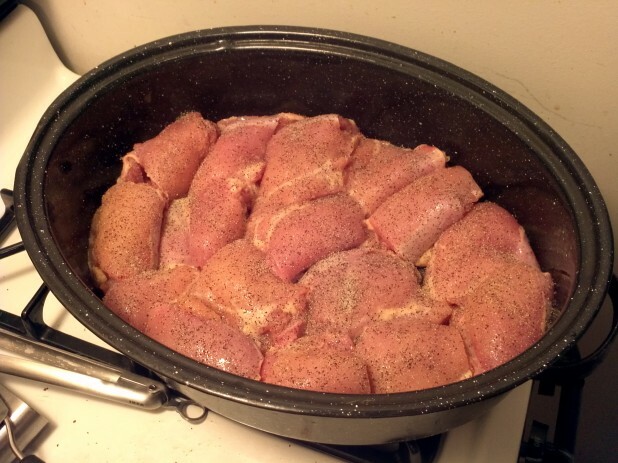 Take the chicken thighs out of the packages and fold them over, packing them into the pan. The nice thing about this recipe is that you can make as many or as few as possible. 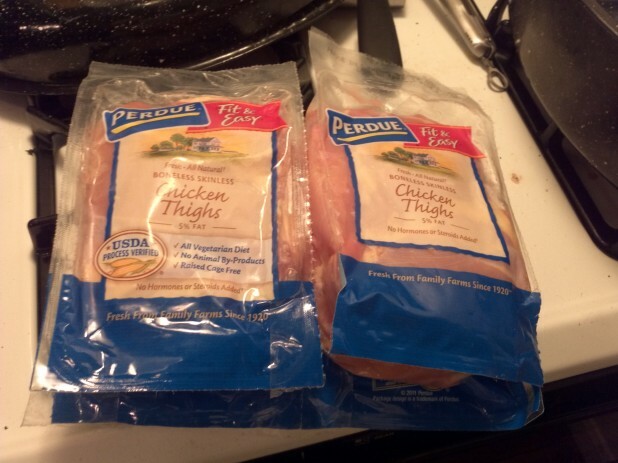 There are two thighs in each lunch so the entire pack can make 12 lunches. The above is 16 thighs. Season the thighs with salt, pepper and garlic. Fill the bottom of the pan. Here are the finished thighs! Take two of the thighs after they have cooled and place them in a resealable container. Break the thighs up so it is easier to eat for lunch. Here is the finished product. Add any frozen vegetable. 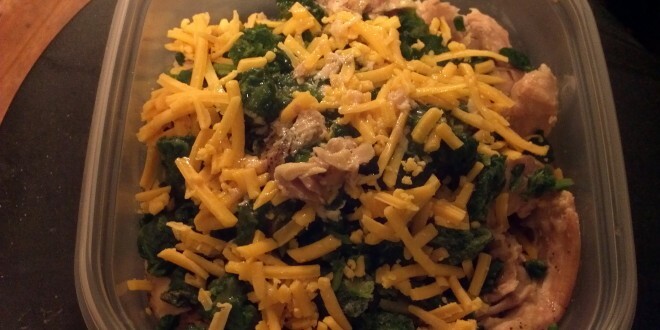 In this case I used spinach. Add cheese on top and equally distribute the juices from the baking. This is an important step because the juices help steam the vegetables when you microwave it. To prepare, crack the lid and microwave it for 1-2 minutes. This will depend on your microwave. At work it takes 2, at home it takes 1.25 for me so it definitely varies. You might also want to stir it part way into the microwaving. Here is the same meal with cauliflower that I made in a previous week. You could even use different vegetables on different days to switch it up a little bit. First of, I wanted to tell you I love you website. It was recommended to me by a friend who has been using your recipes for the past few months and had excellent results. 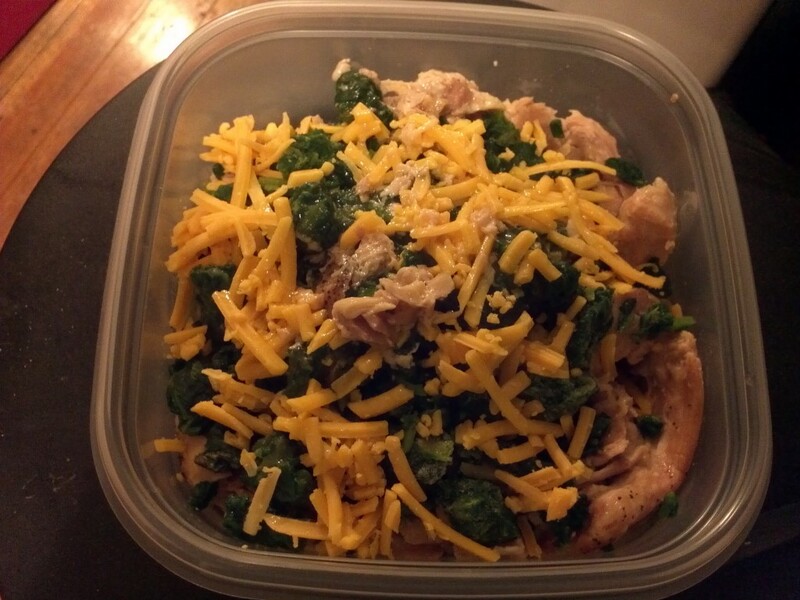 Your site has been a godsend for me, as a newbie to KD, and really helped demystify the diet and helped me get prepared. Plus everything is so delicious! I’m curious if the carbs listed in the nutritional info for your recipes are are net carbs or not? I’ve been deducting the fibre count from the carbs so far and want to ensure I’ve been doing my math correctly. If so, as this dish has 4 g of carbs and 5 g of fibre does that mean it has 0 net carbs? If so, hooray! You have this listed with 4 carbs and 5 fiber? is this a typo? Hmm, that does seem wrong. I reentered the recipe and updated the stats. It should be correct now! My question is can these huge recipes be frozen in containers? Or do you just make a dish and eat that all week?